O nce when I was sick and in the hospital, someone I didn’t know visited me from Church to bring me Holy Communion. She came in and said, “I’m from the Church. Do you want to receive Holy Communion?” I responded, “Yes, thank you.” Then she opened her pix (the container Jesus in the Blessed Sacrament is transported in), walked up to me and said, “The Body of Christ.” To which I replied, “Amen.” Then she left after giving me a pamphlet on how to pray the Rosary. Wow! I laid there bewildered. She had just given me Jesus as though He were a cookie. Jesus is certainly not a cookie, and should never be handed out to just anyone. When Jesus enters into a soul who is outside of grace—meaning one in a state of mortal sin—that not only wounds Our Lord greatly but the recipient’s soul as well, for that is a grave sacrilege. The Eucharistic Minister—the woman who brought me Communion—knew nothing about me. For all she knew, I may not have been to Mass in twenty years and could’ve been dripping with mortal sin. She didn’t even confirm if I were actually Catholic. I have also encountered a similar problem in nursing homes. 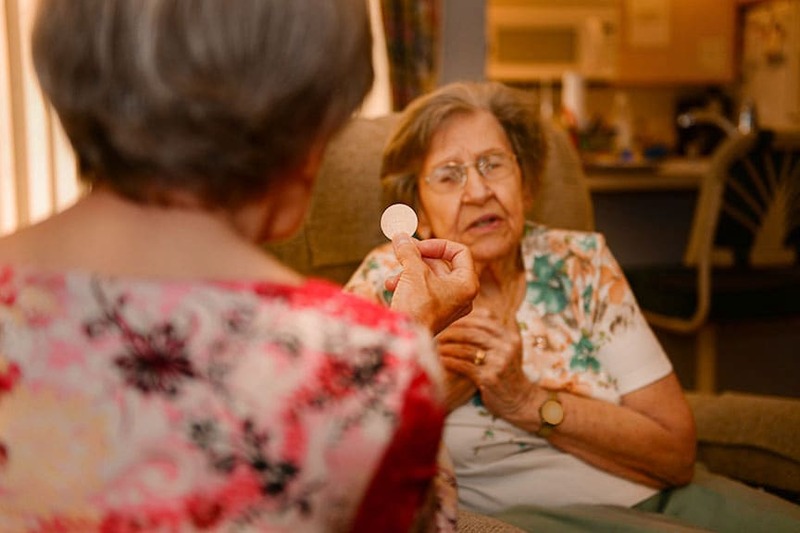 When visiting the nursing home, to bring both love and Holy Communion to the sick and the elderly, I always ask the people—in the most loving manner possible—if they are indeed Catholic, and if so, how long it’s been since they’ve been to Mass and confession. Of course with the elderly—especially those in nursing homes—many are unable to attend Mass, due to illness and lack of transportation even before they were admitted into the facility. If that’s the case, I let them know that God understands their situation. However, if they tell me that they’ve fallen away from the faith, or haven’t attended a Mass for a long time for this, that, or any other excuse, then—out of love—I tell them the truth. I’m not there to bring condemnation onto their souls; I desire to love them and bring them healing—and the truth does just that. Jesus will be scourged mystically and their souls will be damaged if they eat the Bread of Life with mortal sin on their soul. Since I have no way of reading souls, I need to first ask a few questions and enlighten them to a few things to see if they feel they should receive Our Lord. They may even tell me that they aren’t even Catholic or that they’ve committed grave sin. For all who eat and drink without discerning the body,[examining their conscience and receiving forgiveness of their sins through confession – especially for mortal sin] eat and drink judgment against themselves [which is a grave sin worthy of much punishment] (1 Corinthians 11:29). Such joy will enter my heart when a priest—before distributing Holy Communion at Mass—will take time to educate the congregation by simply saying something, in a tone of great love, to the effect of “Many of you here might not realize but if you have chosen to not attend Mass regularly, or have committed any other grave sin without repenting, you must first seek out God’s mercy and forgiveness from your sins—through confession—before receiving Jesus in the Eucharist, or you will damage your soul and deeply hurt Our Lord.” Such messages are greatly needed since, unfortunately, most people at Mass simply don’t know or understand this. God is counting on us to enlighten them to the truth that saves. In this way, Jesus will stop being a cookie for everyone who shows up, and instead be a blessing of many graces for those who receive Him with a pure heart of love. This becomes a delight for Our Lord. “Hi, my name’s ______, and I’m from Saint _______ Catholic Church. How are you doing?” (At this point I don’t mention that I’m bringing Communion, just in case they tell me they aren’t Catholic.) I then speak with them, and bring them comfort and biblical guidance to help ease their pain—especially if they tell me they aren’t doing well. “Are you Catholic?” is my next question. “That’s wonderful!”, I reply, if “yes” was their response. “What parish do you belong to?” Now, if they can not remember the name of the Church that leads me to concern. Then I ask, “How long has it been since you have attended Mass?” If they say it has been a while I ask, “How come?” How they answer this will help me to understand whether there is a possibility of mortal sin. They might give any number of excuses as to why they haven’t attended Mass, and that’s when I explain that going to Mass on Sunday is one of God’s commands, and if we choose not to then we have greatly sinned and need to be reconciled with God in order to have sanctifying grace in our souls. I will even define sanctifying grace by saying, “This is the grace we need to be saved when we die, and when we sin mortally we lose that grace and need to seek forgiveness for that grace to be restored.” Of course it isn’t necessary to go into so much detail—especially if you aren’t comfortable speaking in such a way. The important thing is to know whether they are in a state of grace before giving them Communion. If you are willing to allow God to use you to save their soul with the truth, then please encourage them to go to confession, tell them of its saving graces, and if they so desire it; then call a priest to come hear their confession if they desire. If they think they have committed mortal sin, I encourage confession and won’t give them Communion. I tell them of the abundant graces it will bring to their soul, and what great joy it’ll bring to Our Lord. Sometimes, after I clearly explain everything to them—even though they haven’t been to confession in years—still feel they haven’t committed a mortal sin and wish to receive Communion. In that situation I lovingly give them to Our Lord, praying for them to receive mercy and forgiveness, while I further encourage them to seek reconciliation to receive His many graces, to make themselves even more pure and beautiful in God’s eyes, and I tell them the Church teaches that everyone should go to confession at least once a year.